My first English lesson was grammar with the terrifying Mrs Petrie. She spent the entire time marching up and down the classroom, thwacking various items of school furniture with a ruler while she banged on about the ING part of the verb. I sat there, vibrating with fear, desperately trying to figure out w hat on earth she could mean. Irregular Negative Gerund? Intransitive Nominative Genitive? 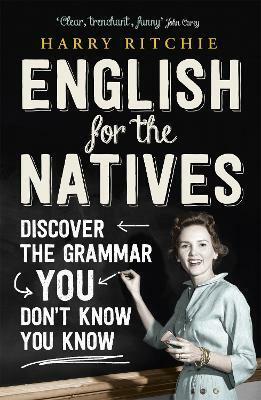 It w as only years later, when I was teaching English to foreign students, that I realised that English grammar wasn't obscure and wilfully difficult but a fascinating subject which I was already brilliant atâ€”and this book will prove that you are too. Forget the little you think you know about English grammar and start afresh with this highly entertaining and accessible guide. English for the Natives outlines the rules and structures of our language as they are taught to foreign studentsâ€”and have never before been explained to us. Harry Ritchie also examines the grammar of dialects as well as standard English and shows how non-standard forms are just as valid. With examples from a wide variety of sources, from Ali G to John Betjeman, Margaret Thatcher to Match of the Day, this essential book reveals some surprising truths about our language and teaches you all the things you didn't know you knew about grammar.